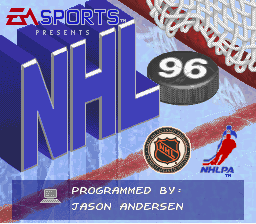 NHL 96 is a typical hockey game with a not at all typical hidden message. Found right at the beginning of the ROM is a message directed at hackers and demo coders. Note that in the ROM this message has no line breaks. Tiburon Entertainment, Inc. developed this product for Electronic Arts. Tiburon is a small developer located in Longwood Florida, a suburb of Orlando. We develop entertainment software for console systems, and IBM Compatibles. If you're a talented programmer or Artist please fax us your resume at 407-862-4077.
to all you hackers and demo coders out there who might be looking through our ROMs. We have good benefits, and pay competitive wages. may still be very talented, and the opportunity may not have been available. In this case we ask your to mail us you're demos, or examples of work you have done. This page was last modified on 27 November 2015, at 02:24.